Summer is already in full blast that is why Dairy Queen’s Free Cone Day is really very timely. I do not know about you, but a big cup of Dairy Queen’s Blizzard sounds like a really great idea to beat this scorching summer heat! I would also like to try their new variant, the Loacker Blizzard. So, wondering how you can score your very own free Dairy Queen cone? Simply be one of the 1st 75 customers on 14 April, 2015 and get your free ice cream! 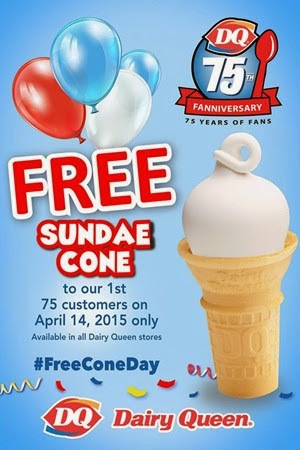 This is in celebration of their 75th anniversary and is available at all Dairy Queen branches nationwide! This entry was posted in announcement, comfort food, free grub and tagged desserts, ice cream on 9.April.2015 by admin.